You built that scope yourself? What can you see from the city? What kind of magnification can you get with that scope? Can you see the Apollo spacecraft on the Moon with your telescope? How do you find things with your telescope? What constellation am I looking at? How far away is the Moon (Mars, Jupiter...)? I bought a star for my (relative, pet, friend...). Can you show it to me? Did we really send spacecraft to the Moon? 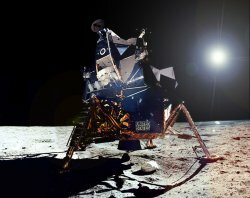 Were the Apollo landings a hoax? If you're referring to one of the big telescopes that looks like a cannon, then yes, it's likely hand-built. These are Dobsonian telescopes, and were invented by John Dobson, the founder of the Sidewalk Astronomers. If you would like to know more, see our Building Telescopes page. Well, city lights wash out a lot of what you can see with a telescope. That's why we drive outside the city to dark skies on weekends, near the new moon phase when the skies are darkest. Within the city, nearly all the planets are visible except Pluto, which is very dim. Mercury, Venus, Mars, Jupiter and Saturn are all visible with the naked eye. Uranus can be found with binoculars, and Neptune can be found with a telescope. I have also seen some of the brighter asteroids from the city, as well. Some of the brighter deep sky objects are visible. For instance, M42, the Great Orion Nebula, the M13 Globular Cluster in Hercules, the M31 Andromeda Galaxy, and the M57 Ring Nebula in Lyra have all been seen from my front sidewalk in San Francisco. Other objects such as double stars are also visible. Sometimes the hard part is navigating the scope to these objects, since you can't see enough stars in the sky to orient yourself! Finally, the Moon is always easy to see when it's up, and makes a great target in almost any telescope. Magnification isn't the most important thing that a telescope does. In fact, you might be surprised to discover that experienced amateurs don't consider magnification very much when they shop for a new telescope. The magnification is changeable. All telescopes use removable, interchangeable eyepieces. By removing one eyepiece and inserting another, I can get any magnification I want. I can use a low magnification eyepiece for star clusters like the Pleiades, or a high magnification eyepiece in order to view subtle details on the planets or the Moon. So you can get just about any magnfication you want on any telescope. Whether or not high magnfication is usable on a given telescope is another story. The most important determining factor for a scope's resolving power is its aperture, or the diameter of its main optical element (called the primary). Depending on the type of telescope, this is either a lens or a mirror. The larger a telescope's aperture, the more light it collects, and the more detail it can show. High magnfication with a small (low-aperture) telescope can often present a blurred image with no visible detail. That is because the high-magnification eyepiece simply magnifies a mushy image from the main telescope optics. The primary optics aren't big enough to resolve a more detailed view. Professional telescopes are huge, elaborate constructs permanently mounted in big observatories. In the world of telescopes, bigger is better! The answer is, "it depends". It depends a lot on the darkness of the sky, and also the size of the telescope you use. The bigger the scope, the fainter and farther you can see (see the previous question). One object that is observable in many amateur telescopes is the quasar 3c273. A quasar is a very distant galaxy that is a source of natural radio emissions. 3c273 is the first quasar discovered, in 1963. It is the brightest quasar in the sky, but even so, it's about two billion light years away. One light year is about six trillion miles. So, the light you're seeing from 3c273 is 2 billion times 6 trillion miles...that's pretty far away. Closer to home, within our own solar system Pluto (roughly 4 billion miles away) can be viewed with an eight-inch telescope or larger (that's a scope whose primary lens or mirror is at least eight inches in diameter). 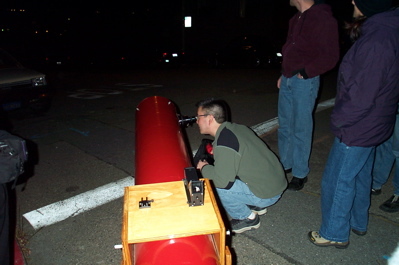 I've observed Pluto with my big, red homebuilt Dobsonian scope. Even with just your own eyes, you can see pretty far. M31, the Great Andromeda Galaxy, is visible to the naked eye on autumn nights with dark skies, away from the city. M31 is about 2.5 million light years away! As explained elsewhere in this FAQ, the finest details a telescope can reveal are limited by the size of its primary optical element. The larger it is, the fainter it can see and the finer the details it can resolve. Here on Earth's surface, we also have to deal with the effects of Earth's atmosphere, which distorts and blurs images, reducing detail. The best and largest telescopes in existence are not powerful enough to resolve details as small as the Apollo moon landers. The Hubble Space Telescope is only capable of resolving details as small as 85 meters (280 feet) on the lunar surface. On Earth, even the largest professional telescopes under the best atmospheric conditions can only resolve lunar features down to about 1 kilometer (0.6 mile) in size. To directly see the Apollo landers from Earth, we would need to have a telescope with a primary optical element exceeding 100 meters in size. And it would need to be in Earth's orbit, above our atmosphere. Even though Earth-bound telescopes cannot see the Apollo landers, an unmanned spacecraft orbiting the Moon, with powerful enough optics, can do so. NASA's Lunar Reconnaissance Orbiter (LRO) is just such a craft, and it has indeed sent back pictures of the Apollo landing sites, showing the spacecraft on the Moon's surface. Thanks to Sky and Telescope magazine for much of this information, which was adapted from their October 2004 issue. Star Hopping. You start with a star chart, either on paper or on a computer screen. It plots many more stars and objects than you can see with your naked eye. But the brightest stars on the chart are naked-eye objects. So you pick a bright star that's near the object you want to find, and center the scope on it - an easy task. Then you look through the scope (or a smaller finderscope), compare the stars you see against the chart, and nudge the scope until you reach your goal. This is the lowest-tech approach. It takes a little work to get the hang of it, but is blissfully simple and enjoyable once mastered. Setting Circles. Some telescopes have graduated rings (analog) or a digital display indicating where they point in the sky. Every celestial object has coordinates in right ascension and declination - like latitude and longitude, only for the sky. You look up the coordinates on a chart or in a book, then adjust the telescope until its indicators match up. Computerized Pointing. Several telescopes have built-in computers, containing a database of coordinates for tens of thousands of objects. You simply key in the name or designation of the desired object on the keypad, and the telescope finds it for you. This is the most convenient and fastest approach, but not all telescopes are equipped with computers. And like anything involving computers, it can be cryptic and flaky at times. Scopes that incorporate this technology are commonly called Go-To telescopes. Most astronomers use either star-hopping or go-to computerized pointing to aim their scope. Some folks use digital setting circles, and hardly anyone uses analog setting circles (graduated rings) to find objects anymore. If you want a free all-sky star map for learning the constellations for the current month, check out Skymaps.com. The Abrams Planetarium at Michigan State University also publishes a monthly Sky Calendar with a star chart, and a listing of interesting things you can see with the naked eye. No telescope is required, though sometimes a pair of binoculars is useful. You can purchase a monthly subscription for a very modest fee. Also see right here on our website, for star charts for the current month and for upcoming celestial events. Stars are giant, burning balls of gas that shine through nuclear fusion. Our Sun is a star, though since it is so close to us compared to other stars we tend not to think of it as such. (If you could shrink the Universe so the distance between Earth and Sun were one inch, the nearest star would still be over four miles away). Believe it or not, astronomers have a hard time agreeing on the exact definition of a planet. But a planet is much smaller than a star, does not burn like a star does, and is found orbiting a star. There are many different kinds of planets, ranging from small, rocky planets like our own Earth and Mars, to large gas giants like Jupiter and Saturn. Shooting stars are meteors, or space rocks and dust. They burn up in the Earth's atmosphere, creating a bright streak as they burn up. Passing comets often leave behind trails of dust and other material in their wake. The Earth moves in its orbit around the Sun at a speed of about 67,000 miles per hour. When the Earth encounters these microscopic bits of dust, they hit the atmosphere at tremendous speed and burn up instantly. We see meteor showers when Earth passes through clouds of debris left by various comets. They tend to happen at predictable times each year because Earth passes through those clouds at the same point in its orbit - corresponding to dates on our calendar. A sunspot is basically a magnetic storm on the surface of the Sun. The Sun generates heat and light through nuclear fusion, deep within in its core. That nuclear fusion also generates strong magnetic fields. Hot gases inside the Sun swirl around, much like boiling water in a saucepan, and bend the magnetic fields. Every now and then, several magnetic fields intersect at one point on the Sun's surface, and get "knotted up" with each other. At that point on the Sun's surface, the upwelling of hot gas from below is constricted, and that spot cools down. Even though that location is still very hot, it is cooler than its surroundings, and so it looks like a dark spot when viewed through solar telescopes. Sunspots follow an 11-year cycle, with many visible during the peak of the cycle and few if any visible when the cycle is at its ebb. This cycle is caused by the way in which the magnetic fields inside the Sun turn and twist. Never try to view the Sun without the proper equipment, or you could permanently damage your eyesight. The Sidewalk Astronomers use special solar telescopes and filters designed for safe Sun viewing. The Nine Planets is an excellent website that will tell you everything you want to know about the Solar System. I am deeply sorry to tell you that your money has done nothing except line the pockets of a company that has given you an empty promise. You may have heard or seen ads from companies that will offer to name a star on your behalf for a fee. They will send you a certificate and a chart to make you think you actually named a star. In reality, none of these companies are authorized to name stars. They are simply taking your money. I hear the ads for these services on a local newsradio station â€” often while taking my telescope out for an evening observing session â€” and I'm concerned that by running this kind of scam, they give astronomy a bad reputation. No amateur or professional astronomer ever wants to break this news to you personally. We don't enjoy telling you the sad truth directly, because we know that you love your relative or pet deeply, and believe this gesture on your part is the best way you could honor them or the deepest gift you can give. But that doesn't stop other, less scrupulous people from capitalizing on your feelings of affection and devotion in order to simply take your money. Buying a Star FAQ. 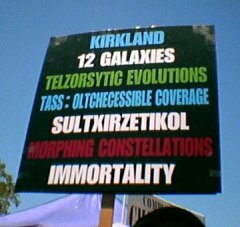 Learn more about why these star-naming services are a waste of your money. Official statement on naming stars from the International Astronomical Union, the worldwide organization that does have the authority to name astronomical objects. Hunting the Dead Poodle Star. My friend and fellow Sidewalk Astronomer Jane Houston Jones helps an innocent scam victim view the star she "bought" in memory of her dead poodle. In an earlier question, we noted that it is impossible to see the Apollo spacecraft from Earth with any telescope currently in existence, including Hubble. And until recently, not even orbiting spacecraft have been able to resolve details as small as the Apollo spacecraft (though that situation has changed). The lack of direct evidence might prompt some people to speculate the Apollo Moon landings were somehow faked, that the lunar surface was a soundstage in Hollywood or something. Did we really go? Yes, we really did send spacecraft to the Moon. There is plenty of evidence, such as rocks we brought back, photos of the far side of the moon taken from the Apollo craft as it orbited the Moon, tons of scientific data measured by people who walked on the surface, and scientific instruments left on the Moon which are still used today. Not to mention living beings who can actually testify that they went. Don't believe me? Okay, let's just use a little common sense. Oddly enough, it was easier to actually go to the Moon than to have faked it back in 1969. We actually had the technology then to go to the Moon; what we didn't have then was the special-effects technology necessary to simulate the event down to the last detail on worldwide TV without it looking "fake" in some way. In particular, the Moon's gravity is one-sixth that of Earth, and there is no atmosphere. It would have been impossible at the time to film lunar surface sequences, with people and objects moving realistically in the low gravity and vacuum, on an Earthbound stage. Nowadays, it can be done with digital effects, but digital effects technology simply didn't exist in 1969. During the Apollo 15 mission (six Apollo missions landed on the Moon over a period of three years), astronaut David Scott dropped a feather and a ball to prove Galileo's 400 year-old assertion that all objects fall at the same speed in the absence of air. Both feather and ball fell as Galileo predicted, at the rate appropriate for the Moon's gravity. Without digital effects, the only way to reproduce this scene on Earth would have been to pump all of the air out of an entire soundstage â€” an impossibility even today. Still don't believe me? Okay, let's try some more common sense. It was no secret that the United States and the Soviet Union were both in a race to put a person on the Moon. The Russians actually landed several robotic craft on the Moon while the United States pursued its manned space program. If the Moon landings were a hoax, don't you think the Russians would have called the United States on it? They surely had the resources and the know-how to be able to scrutinize the American Moon landings. It would have been a huge propaganda coup for them, during the height of the Cold War. They didn't, because they knew it was true. If you still reject the mountain of evidence and common sense, and continue to believe the Moon landing was just a great big government conspiracy, see Phil Plait's web page on his Bad Astronomy website for a thorough refutation. You can also check out the Wikipedia entry on the Moon Hoax. Okay, you're still curious. No, I have never observed anything that I could not identify. Part of the reason is that I'm an experienced observer. I've seen the Milky Way, planets, artificial satellites, the International Space Station, the Space Shuttle, and all manner of things in the sky. I know what they look like, and I know where to look to find them. So very little, if anything, of what I see in the sky surprises me. None of the other amateur astronomers I know have reported seeing UFOs, either. Amateur astronomers like to look in the sky so much that we've seen nearly all the things that people mistake for UFOs. For instance, many people mistake Venus for a UFO. It's very, very bright, and it seems to "follow" you around in the sky when you move. It's an optical illusion of course, but its enough to fool people. I (and other amateur astronomers) just look at it and say "that's Venus, how lovely." Another example of mistaken UFOs are Iridium flares. Iridium is a group of 88 earth-orbiting satellites that are part of a failed worldwide cellphone network (it's now owned and operated by a private company who bought the network from its original developers). No matter where you are on Earth, every now and then one of the satellites will catch a glint of sun - and you will see what looks like an incredibly bright star that moves across the sky, lasts for maybe thirty seconds, then mysteriously fades away. Lots of amateurs search out these flares (and you can too). But someone who is not aware of these flares can easily mistake one for a UFO. Do I believe in life on other planets or stars? There's so many stars out there, and planets around stars have been proven to be pretty common. So I believe that there's other life in the universe. But no, I don't believe the aliens have found us yet. Carl Sagan was quoted as saying "Extraordinary claims require extraordinary evidence." Aliens from other worlds are pretty extraordinary; and we just don't have the extraordinary evidence to prove they're here. Okay, it might be fun to look at the newspaper horoscope, but astrology truly has nothing to bear on our lives. For one thing, astrology is based on science and stellar alignments from thousands of years ago. For instance, the dates the Sun is currently in a given constellation do not line up with the astrological dates of the constellation. Astrology is based on 12 constellations in the Zodiac, when in fact there are anywhere between 13 and 24 constellations, depending on your definition of the Zodiac. The original astrologers didn't even know Uranus, Neptune, and Pluto existed. How could they have made accurate forecasts? Astronomers are discovering new worlds in the outer solar system every day. In fact, as I write this (March 2004), just last week a new world (Sedna) was discovered in the outer solar system. How does this affect astrological forecasts? What about the planets we are discovering, and continue to discover, around other stars? Do they affect astrology, and how? What about all the astrology forecasts that have been done up to this point? Are they all wrong in the face of these new discoveries? Finally, there's no evidence that any alignment of the planets or the Sun has an effect on events on Earth. This has been verified in scientific studies. For some more detailed, common-sense arguments, see Your Astrology Defense Kit by Andrew Fraknoi, and Phil Plait's page on astrology at his Bad Astronomy website. Science, including the astronomers, astrophysicists, and cosmologists, has not been able to prove God's existence. Nor has it been able to disprove God's existence. Nor is it likely to ever do so. Given that science cannot answer the question of God's existence one way or the other, it really comes down to a matter of Faith. Do you believe in God? What I believe doesn't really matter. But I certainly agree with John Dobson when he says, "The Exterior Decorator does good work!"